Oral care from infanthood is important for developing strong healthy teeth & gums in your child. Made from food grade & premium quality transparent silicone. 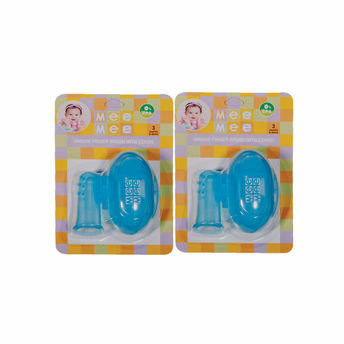 Mee Mee's Unique BPA Free Finger Brush can be used to gently cleanse your baby's teeth after feeding/meals. Apart from cleansing, this brush provides relief to the child's tender gums during the teething phase & also offers oral stimulation. Approved and recommended by leading Paediatrics. Made from 100% non-toxic and BPA free super-soft silicone materials. The outer side of the brush has soft & fine pressure points which stimulate and massage the gums. This gives baby relief from soreness during the teething phase. Being colored, the brush reflects the milk & food particles that are being removed and helps you clean baby's oral cavity more thoroughly. Easy to use, sterilise and store. Easy to carry in diaper bag.